Igmund is a Nord barbarian who rules the city of Markarth as jarl with assistance from his steward and uncle, Raerek. He is supportive of the Imperial Legion in the current civil war. If the Stormcloaks take control of the hold, he will be replaced as Jarl by Thongvor Silver-Blood. When discussing the city's history under his father's leadership, Igmund reveals that when Cyrodiil was invaded by the Aldmeri Dominion during the Great War, the Empire began ignoring all other provinces and were forced to deal exclusively with the war. Because of this, the Imperial Legionnaires in Markarth were recalled, leaving the city vulnerable to the impending Forsworn rebellion. With no Legion to assist the besieged city, it fell temporarily and created a brief "independent kingdom." After the Great War, the Empire sought to reclaim the Reach. With no other options, the Empire and Jarl Hrolfdir established a militia to reclaim the Reach, offering them religious freedom in exchange for their aid in overthrowing the independent Forsworn empire. Ulfric Stormcloak was one of the members of the militia. However, the Thalmor discovered this, and demanded the arrest of Ulfric and the other members of the miltia, since they were in violation of the White-Gold Concordat. The Thalmor placed political pressure on Igmund's father, effectively forcing him to turn over Ulfric, in order to preserve the new-found peace the Empire had with the Dominion. Igmund followed in his father's footsteps when he became the new Jarl of Markarth, after the Forsworn murdered his father, and he firmly believes that the arrest of Ulfric and the Nord miltia was in the best interests of Skyrim and her people, in order to prevent another war with the Thalmor. Igmund wears embellished robes, a pair of fur-lined boots, and a copper and sapphire circlet. He is equipped with a steel sword and a steel shield, and carries a selection of upper-class loot and gold. Dungeon Delving: Do a favor for Igmund, the Jarl of Markarth by retrieving a shield. Thane of the Reach: Gain the title of Thane of the Reach. Igmund: "He/She wants the city this badly, he/she can fight me for it." Faleen: "No, Igmund. It's too dangerous." 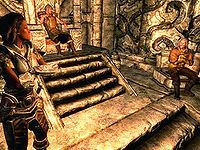 Igmund: "I will not surrender Markarth without raising my own sword in her defense." Faleen: "Kill them all. Protect the Jarl at all costs!" Thongvor: "Ready to listen to the Silver-Blood family now, Igmund?" Igmund: "Thongvor. I should have executed your whole treacherous clan when I had the chance." Thongvor: "Don't worry. We'll take good care of your city when you're gone. When Ulfric Stormcloak becomes High King, Skyrim will finally be the way my ancestors intended. It's a new day in Markarth." Galmar: "Are you two quite done? You, go pack your things. 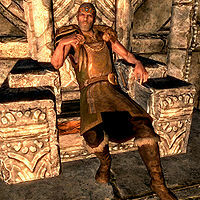 And you, go sit on that damn chair and start acting like a Jarl." Thongvor: "Come Galmar, we have much to do." Igmund: "The Empire will return. Count on it." Igmund: "Ahhh... It's good to be home." Thongvor: "Welcome back. I've left a few surprises for you to discover." Igmund: "How kind of you. And I've brought an army to give you a going away parade." Rikke: "If you two are finished with the touching homecoming, there's a city in chaos out there." Igmund: "Indeed. Come, there is much to be done." The green on Igmund's clothing parallels that which is used on the Markarth banner and the guard armor/shields. This page was last modified on 24 May 2016, at 18:18.